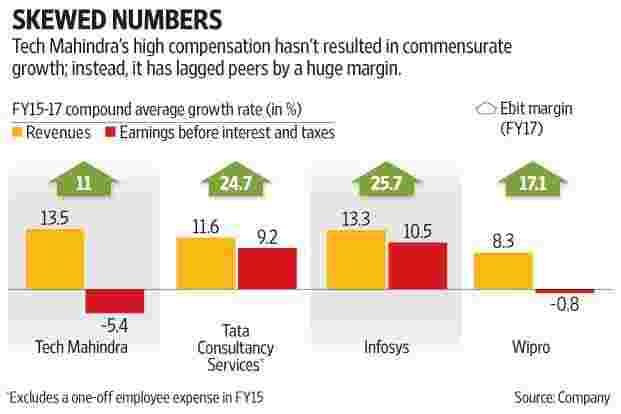 While there has been a big commotion about Infosys CEO Vishal Sikka’s pay, Tech Mahindra Ltd’s outrageously high compensation for its top executives hasn’t elicited a whimper of protest. But now, with the company’s performance deteriorating sharply, it’s high time investors questioned executive compensation. Tech Mahindra’s operating profit margin plummeted to 8.2% in the March quarter, from around 18% two years ago. Growth in the key telecom segment—around 48% of revenue—lagged peers by a huge margin. There are no signs of a recovery, and it isn’t surprising that the company’s shares fell nearly 12% on Monday. While Tech Mahindra’s profits are lumbering along, in stark contrast, it has led the charts with respect to executive compensation. In FY15 and FY16, chief executive officer C.P. Gurnani’s compensation amounted to Rs210.9 crore, or as high as 3.1% of pre-tax profit. That’s not all. Vineet Nayyar, who was executive vice chairman of the company till August 2015, received compensation of Rs299.4 crore, or 4.4% of profit for the period. In comparison, Sikka’s Rs49 crore compensation for FY16, looks modest, amounting to a mere 0.2% of profit. Tata Consultancy Services Ltd’s (TCS’s) Natarajan Chandrasekaran collected Rs25.66 crore as remuneration in FY16, only 0.1% of profit. One may argue that Gurnani and Nayyar’s reported remuneration is skewed because a large portion of it is on account of stock options exercised during this period. But large stock option grants impose a cost on the company and its investors because of the equity dilution they cause, and it’s best to include them while looking at overall compensation. Another argument could be that these options were granted earlier, when the company’s performance was better, and it’s only that a part of the cost is reflected now because some of the options are being exercised. But as an analyst at a multinational brokerage says, if past performance was rewarded generously, the company’s board should also consider commensurate action to address present troubles. In any case, the high compensation of recent years sticks out like a sore thumb, and it’s best Tech Mahindra allays investors’ concerns. Analysts are peeved about the high compensation structure, especially since there’s been nothing to show in return, at least in the past couple of years. While revenue rose at an annual average rate of 13.5% in the past two years (in FY16 and FY17), aided by acquisitions and the depreciation in the rupee, operating profits declined at an average rate of 5.4%. Infosys and TCS have managed to grow profits at an average annual rate of 10.5% and 9.2% respectively during the same period. Even Wipro Ltd, which has struggled for growth in recent years, managed to contain the decline in margin and profit to a lower level. Its profit has been more or less flat in the past two years, declining by less than 1% on an average each year. Tech Mahindra’s financial performance took an especially ugly turn in the March quarter, with its margin falling to unheard of single-digit levels. Even most mid-cap companies operate with double-digit margins. Of course, last quarter’s expenses included some one-offs, although it will be foolhardy to expect a quick recovery in margins. According to Nomura Research, revenue from the key telecom segment fell 1% for Tech Mahindra, while it rose 8% for tier-1 IT companies. Lightbridge Communications Corp. (LCC), a $240 million acquisition from 2014, has been in trouble in recent quarters, and is still to bottom out. LCC’s troubles are pulling down growth in the mainstay telecom business. Worse still, one of the company’s largest clients eked out a large discount on pricing, which, some analysts fear, could cause some other clients to follow suit. With Monday’s 12% fall, investors have taken a big hit. Tech Mahindra now trades at less than 11.5 times estimated FY18 earnings, a huge discount when compared to the average of around 17 times earnings for other large IT companies. Analysts say it’s only fair the top management pays a price as well.